I like what I see. It's fun to scroll through. On images 28 and 29, the Warmongers Chapter show up twice. And yes, I double checked, it's the same Chapter with the same name and same iconography and paint scheme. I only noticed them because I can't stand them- they're a particolored sham of the Warbearers. J/K. That comes later when I make all the little marine picture clickable - taking you straight to their IA! Until then your best bet is to ask Dazzo as he has all the information and records. I have been looking over the 1000 chapter project, and I can't help but notice that the Grey Knights are not there...Was this an intentional choice or did they just get misses? Well this is pretty cool, and yay! my Chapters are in! On my piddly old screen I can definitely see the drop in quality being significant. The pic on the right/bottom is a lot more blurry and pixelated. Glad to see this continuing to change. But i'm still not done with searching for my old creations. Beware. The issue with those duplicates has been solved, at least on the blog, and excubitors are now heralds of light ok i'll sort that. Update: I've edited the first post in this thread to make it more appropriate to the project. IA is in my signature. Edited by NightrawenII, 21 September 2009 - 04:53 PM. Are they loyalist? They have to be loyalist to be on the list and your IA seems to have them leaning towards mutated renegades or are you changing that? Not perfect but once shrunk down it should be OK.
wow thats a cool gk image there! Thanks mate, and thanks to you to Yogi! Dazzo, how many do you have now? I'm wondering if I should prototype a clickable popup? Altogether I got just about 700 chapters give or take one or two either way, not all of which can be viewed just yet. Edited by Dazzo, 23 September 2009 - 07:09 AM. Use the B&C Gallery to host your badge image. I've prototyped the 'clickable marines' in the first popup (only the first popup) - but you'll notice that some are missing links! These missing links defeats the whole idea of a visual index! Instead of leaving marines with missing links blank, perhaps I should put in a general link that will take you to a new thread on B+C where you can submit missing links? If no links exist, perhaps some fans will make some IA on B+C and then we can link to that? Or should marines with no links be removed? If you start removing marines with no links you'll end up back tracking significantly. I can only really provide links to the Chapters I have supplied to the list (a large portion which haven't been included on your site yet). 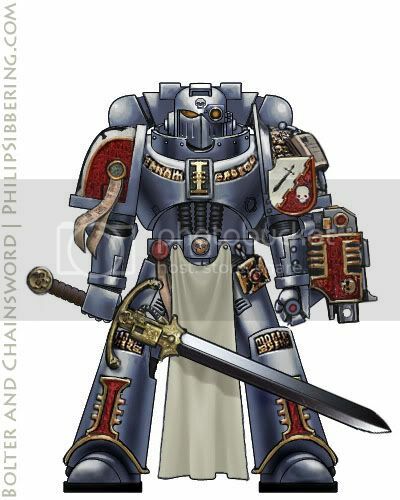 Mostly placeholder links to my blog until I get my Index Astartes Falconius site sorted out. Edited by Heru Talon, 23 September 2009 - 04:12 PM. I am doing a database but that is also in its infancy. I say dont worry about it phil, just link the images with the info available and we can sort out the rest later. Edited by Dazzo, 23 September 2009 - 03:56 PM.